Every boy at St. Christopher’s participates in athletics and physical education. Doing so encourages a commitment to good health, while fostering their understanding of the importance of teamwork and fair play. 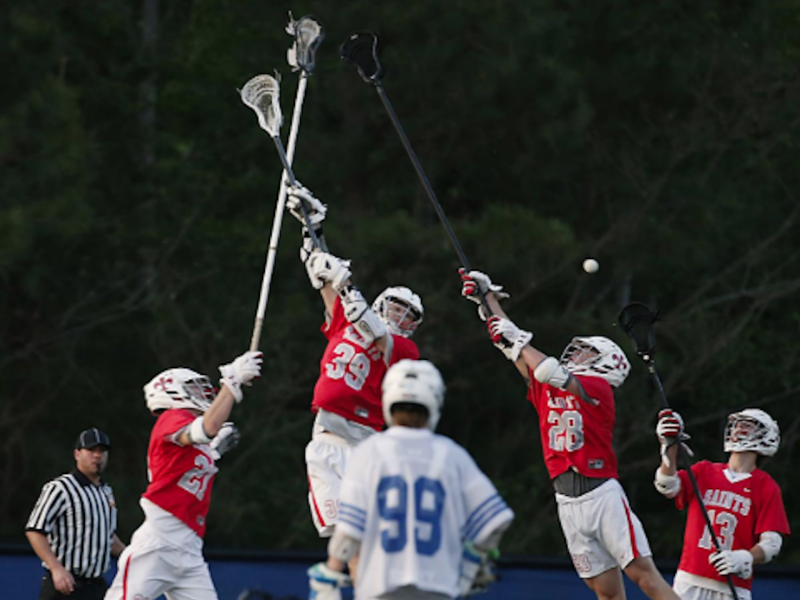 Valentine '19 throws in six goals to pace the Saints. Earns split with Cougars for 2019 season. Downs WFS and Norfolk Academy in past two matches. 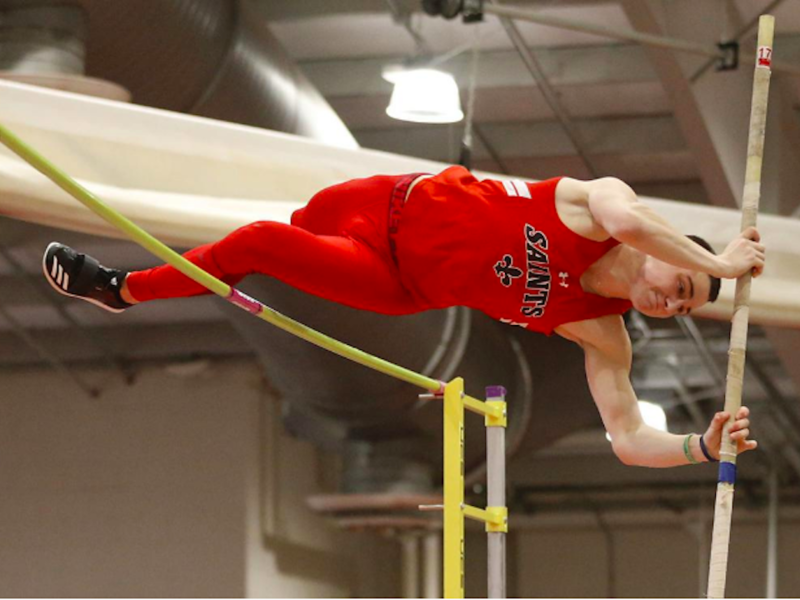 Richmond Times-Dispatch honors UVA-bound decathlete. Diver and record-setting swimmer are repeat winners. 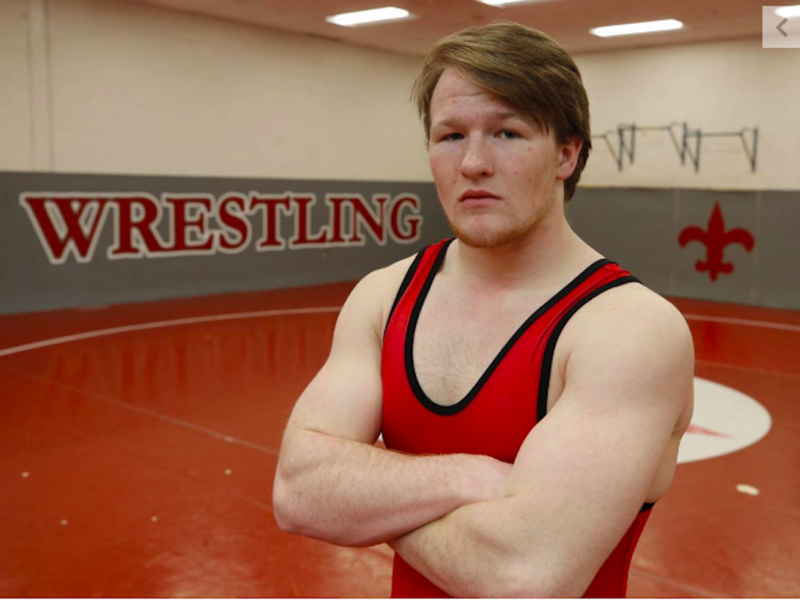 All-Prep, All-State DE will be a Captain. Roggie '21 first-team, Alexander '19, Dubois '21 and Keeling '21 second team. 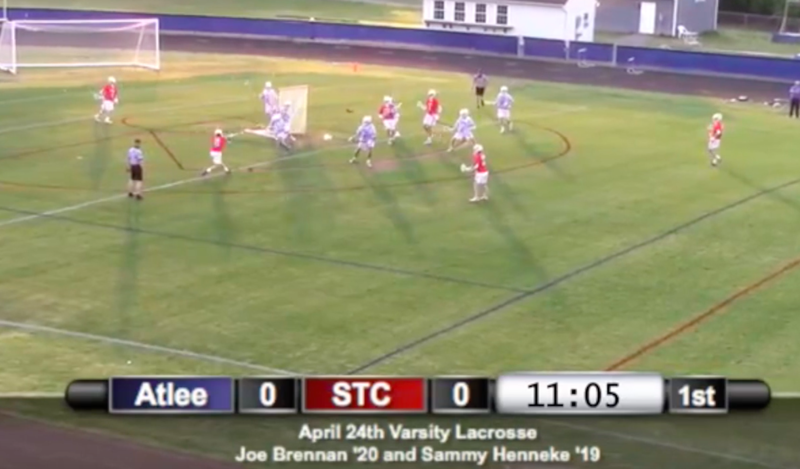 VLAX - StC 15, Atlee 3 2019 Varsity Tennis Team Smith '19 to CNU VLAX - StC 11, STAB 10 (OT) Arcadia Invitational - Decathlon 2019 Varsity Baseball Team 2019: Faculty 49, Seniors 46 Road To States - Episode 3 VBB - StC 65, WFS 42 Futsal - StC 6, Collegiate 0 Elby Omohundro '19 breaks school TJ record VBB - Collegiate 51, StC 45 Road to States - Episode 2 VBB - StC 61, STAB 57 Futsal - StC Red 3, TES 0 Futsal - StC Gray 2, Collegiate 1 2018-19 Varsity Indoor Track Team 2018-19 Futsal Team VBB - StC 49, BCP 45 JVBB Benedictine Game Winner Swim Meet - 1/19/19 Dive Meet - 1/16/19 VBB - StC 50, WFS 47 JVBB TES Game Winner Road to States - Episode 1 VBB - StC 79, Church Hill 52 2018-19 Varsity Basketball Team 2018 Football Dinner Video Lewis '20 chooses Army 2018 Signing Day - Nov. 14 Omohundro '19 chooses UVA Royal '19 chooses UCLA Boggs '19 chooses W&amp;L Alexander '19 UNC-bound VSOC - StC 4, Norfolk Academy 0 VFB - Collegiate 35, StC 21 XC - Bowles '21 Prep League champ Wallace '20 chooses Cornell VFB - NCA 27, StC 19 VSOC - StC 3, Collegiate 0 Turley '19 picks Rutgers VFB - Flint Hill 44, StC 22 VSOC - StC 9, John Paul 0 VFB - StC 61, FUMA 27 JVFB - StC 35, FUMA 0 VSOC - StC 7, TES 0 VFB - StC 35, O'Connell 0 VSOC - Paul VI 3, StC 2 8FB - StC 14, Cherokee 0 VFB - StC 47, TES 40 VFB - StC 27, Norfolk Academy 24 JVFB - StC 15, Norfolk Academy 8 Cooper '19 UR bound Westfall '19 Sewanee-bound VFB - WFS 31, StC 28 2018 Varsity Soccer Team 2018 Varsity Football Team 2018 Cross Country Team 8FB - StC 22, Caroline 16 VSOC - StC 8, Ireton 1 VFB - StC 17, SSSA 7 Gillenwater '19 to Mercer Jordan '19 to VMI JVSOC - StC 5, TES 0 VFB - StC 40, TES 40 (Suspended) Valentine '19 to Sewanee VSOC - StC 5, North Cross 0 Routsis '19 to ODU Henderson '19 to VCU 2018 Senior Slideshow 2018 Athletic Banquet Video VBASE - StC 7, Norfolk Academy 2 Farley '18 interviews Biddison '18 after blast VBASE - StC 3, Collegiate 1 A Week With...Track &amp; Field "All In" - Episode 2 Hackney (StC) d. Ha (WFS) 10-6 VBASE - StC 2, TES 1 VLAX - Collegiate 9, StC 8 DOGWOOD TRACK CLASSIC • 100m FINALS DOGWOOD TRACK CLASSIC • 200m FINALS DOGWOOD TRACK CLASSIC • 800m FINALS #1 VBASE - May 4, 5, 8 Highlights Szymendera on Prep League Title "All In" - Episode 1 Frank Royal '19 - 24-4 1/4 LJ Var. Tennis - StC 5, Collegiate 4 VBASE - StC 10, STAB 0 2018 Varsity Golf Team Moore '19 to UNC Levengood '19 picks W&amp;M VBASE - StC 6, TES 1 Nick Biddison '18 Interview Luke Valentine '19 Interview VLAX - StC 13, Atlee 9 VBASE - StC 8, BCP 5 2018 Lacrosse Team 2018 Spring Signing Day StC Sports Show - 4/12/18 2018 Tennis Team Murphy '18 Postgame Interview 2018 Varsity Baseball Team Foster '18 to VCU VBASE - StC 5, Deep Run 0 VLAX - StC 8, Durham Academy 2 VLAX - StC 11, Potomac 2 VBASE - StC 7, Altoona 0 State VISAA Interviews Futsal - StC 1, Collegiate 1 VBB - Collegiate 59, StC 56 VBB - StC 67, BCP 54 Futsal - StC 4, TES 1 Frank Royal '19, 24'2.25 Long Jump (#2 US) VBB - StC 69, CCS 64 Rice '18 breaks own PV record Wrestling - StC 53, StC 22 Tappen '18 to JMU 2017-18 Indoor Track Team Sean Hogan '19 commits Futsal - StC 6, Trinity Episcopal 0 VBB - StC 68, WFS 55 Basketball Third at Tri-CIty Tourney Wrestling - StC 40, BCP 25 Signing Day - Dec. 20, 2017 Futsal Highlights 12/7/17 English '13 welcomes Hudepohl StC Sports Show - 12/12/17 St. Paul Quad - Interviews St. Paul's Quad - Interviews Freshmen Shine at JV Alliance Freshmen Shine at JV Alliance Rice '18 headed to VT Hart '18 to UVA VBB - StC 70, Bishop Sullivan 68 Cross Country State Champs! VSOC - CHC 2, StC 1 VFB - Collegiate 21, StC 7 2017 Signing Day - Nov. 8 VSOC - StC 1, Potomac 0 VSOC - StC 5, NA 4 (OT) VFB - StC 13, Collegiate 10 (OT) VSOC - StC 2, TES 0 Andrews '18 commits to Roanoke StC Sports Show - 10/26/17 VSOC - StC 5, Collegiate 2 VFB - StC 37, Ireton 0 VSOC - StC 3, STAB 1 VFB - StC 27, Paul VI 0 Ames headed to W&amp;L VSOC - StC 9, FUMA 0 VFB - StC 35, FUMA 18 VSOC - StC 3, CCS 1 Davis '18 commits to American VSOC - StC 4, TES 1 JVFB - StC 31, HSHS (9) 22 VFB - StC 28, Norfolk 7 VSOC - CHC 3, StC 2 VSOC - StC 3, Collegiate 2 VFB - WFS 49, StC 28 JVFB - StC 43, WFS 0 VFB - StC 21, SSSA 20 (OT) VSOC - StC 4, Episcopal 0 2017 Cross Country Team VFB - StC 26, TES 0 2017 Varsity Soccer Team Widhelm '18 to Furman Jasper '18 picks UR Schroeder '18 commits to JMU 2017 Athletic Banquet Senior Slideshow 2017 Athletic Banquet Video VBASE: StC 8, Norfolk Academy 2 VLAX: StC 12, Potomac 6 2017 Spring Signing Day 2017 Golf Team 2017 Lacrosse Team 2017 Outdoor Track Team VBASE: StC 5, TES 0 Burke (StC) vs. Rose (Midlo.) VLAX: StC 7, Good Counsel 5 VBASE: StC 9, Collegiate 7 2017 Tennis Team Barkstrom (StC) vs. Pande (DR) Barkstrom (StC) vs. Phillips (C) VLAX: StC 18, Benedictine 3 2017: Faculty 39, Seniors 35 2017 State Indoor Track Champs 2017 State Champ Jens Ames '18 Trey Ashby '18 Third at States 2017 State Champ Connor Alexander '19 2017 State Champ Gray Hart '18 2017 State Champ Bo Williamson '17 2017 State Champ Jackson Turley '19 2017 State Champion Jackson Turley '19 2017 State Champion Tanner Hood '17 2017 State Champ Jens Ames '18 Coach Ware on State Title Wyatt Campbell '19 - 3200 Champ Christian Sherod '18 - Prep League HJ Champ Royal &amp; Omohundro - Prep League Champs Harrison Rice '18 - Pole Vault Champ Captains on Prep League Title 2017 Valentine Classic Champs STC MEET #6 — Varsity Boys 4 x 200m Relay (Colin Royal) Big Man 4x200 Relay Documentary Omohundro '19 School Record TJ 2017 Signing Day Interview: Alexander Petrie '17, 1/26/17 2016-17 Squash Team 2016-17 Futsal Team Harrison Rice '18 - School Record 15-6 Vault Futsal: Levengood Goal 1/19 Futsal: G. Levy '17 Goal 1/19 VBB: StC 67, Woodson 64 VBB: StC 77, Walsingham 58 Wrestling: StC 36, Forge 32 2016-17 Wrestling Team 2016-17 Indoor Track Team Edward Anderson Goes Pro Edward Anderson '17 Goes Pro VBB: StC 58, Norfolk Academy 42 2016-17 Basketball Team 4-Time Rebel Champs VBB: StC 65, Tucker 51 VBB: StC 60, Atlee 57 State Title Interviews 2016 Soccer State Champs! Meet the State Champs! Signing Day - Petrie '17 Wielar '17 to Davidson Wyatt Campbell '19 Interview VSOC: StC 2, Paul VI 0 VSOC: StC 4, CHC 3 VFB: Collegiate, 30, StC 22 JVFB: StC 38, Collegiate 0 Damgard to Mitchell 88-yard TD VSOC: StC 3, WFS 0 Johnson '18 chooses VT Levengood '19 Interview VFB: StC 35, Ireton 21 VSOC: StC 3, NA 1 XC: STAB JVSOC: StC 6, BCP 0 VFB: StC 35, Paul VI 0 JVFB: StC 36, Paul VI 0 JVSOC: StC 11, FUMA 0 VFB: StC 50, FUMA 42 VFB: StC 38, NA 17 VSOC: StC 2, TES 1 2016 Football Team JVSOC: StC 9, CCS 2 2016 Cross Country Team 2016 Soccer Team JVFB: StC 26, Norfolk Academy 12 VSOC: StC 5, Collegiate 0 VFB: StC 48, STAB 6 VFB: Damgard to Mitchell JVFB: StC 26, Benedictine 0 VFB: TES 10, StC 9 VSOC: StC 3, North Cross 0 2016 Athletic Banquet Video 2016 Athletic Banquet Slideshow 2016 State Champions Spring 2016 Signing Day VBASE: LCA 7, StC 4 VLAX: StC 8, WFS 4 (Senior Day) 2016 Outdoor Track Team VLAX: StC 6, Collegiate 5 Thomas 47.45 in 400 PENN RELAYS • BOYS PREP SCHOOL 4 x 400M CHAMPIONSHIPS PENN RELAYS • BOYS SMALL SCHOOL 4 x 100M VLAX: StC 10, Norfolk 6 Penn Relays 4x400 Prep School Champs Andrews '16 to Sewanee 2016 Baseball Team 2016 Tennis Intro Bailey '16 racing at Southside Speedway Fitch '17 to George Washington StC 4, STAB 3 S. Petrie '17 Interview Hodgson '16 to W&amp;L Peete '16 to W&amp;L Thomas '16 commits to VT StC 15, DeMatha 9 2016 Lacrosse Intro Cuevas '16 to William &amp; Mary 2016 Golf Team Vaeth '16 headed to Sewanee New Balance Indoor National Championships 30 for 30: The House That Benny Built Five Wrestling State Champs State Wrestling Top 3 Placers StC Conversation - Nick Sherod '16 Pole Vault 1-2: Rice '18 &amp; Pedin '17 4x400 - 2016 Prep League Champ Futsal - Valentine Classic 2016 StC Pregame Show: StC at STAB VBB: StC 64, TES 48 Futsal Intro - 2015-16 VBB: StC 62, STAB 61 Brandon Thomas '16 - 55m Record Holder Sean Menges '16 - 500m Record Holder Wrestling Intro LCA Pregame Show, 1/8/16 PR HOLIDAY INVITATIONAL Furman '18 to VCU Bemiss '16 to Cornell Cox '16 to Davidson VBB: Rebel Invite Recap 2015-16 Basketball Intro Fernandez to Richmond VSOC: Paul VI 4, StC 2 2015 Prep League Meet VFB: Collegiate 20, StC 18 Jack Workman, All-Prep 2015 Joey Cuevas, All-Prep 2015 VFB: WFS 49, StC 14 Halftime Show - Oct. 31 VSOC: StC 2, Collegiate 0 TES Pregame Show VFB: TES 48, StC 33 Soccer Weekend Recap Biddison '18 commits to UNC VFB: StC 48, Paul VI 10 VSOC: StC 11, FUMA 0 Gitomer on Prata Prata '16 to Virginia Tech Brockwell '18 to Virginia Tech VFB: FUMA 26, StC 14 VSOC: TES 1, StC 0 VSOC: StC 3, CCS 0 Pregame Interview: Jalen Maurice '17 Abrash '16 to Richmond Swanson '16 to Michigan Ferguson on Swanson's commitment VFB: StC 39, NA 7 FB Pregame Show - Norfolk VSOC: StC 6, CHC 0 VSOC: StC 1, Collegiate 0 StC 51, STAB 22 SID Intro - Fall 2015 Football Pregame Show Pierce Edlich '16 VFB: StC 37, TJ 7 2015 Varsity Football Intro 2015 Sailing Team VFB: StC 23, SS/SA 3 2015 Varsity Soccer Team 2015 Cross Country Intro 2015 Athletic Banquet Video 2015 Athletic Banquet Slideshow 4 x 800 Relay - State VISAA Championships 400-meter dash - VISAA Championships VLAX: StC 6, Collegiate 5 4 x 400 Relay - State VISAA Championships VTEN: Alston Hackney '18 Tennis State Champs! VTEN: Jackson Barkstrom '17 Valenzuela '15 to Roanoke Cottrell '15 H-SC bound H-SC gets Lanier '15 and Anthony '14 Dotter '15 to R-MC Golf Prep League Runner-Up GOLF: StC 143, WFS 156 Johnson '15 to CNU Lynde '15 to Sewanee VLAX: Collegiate 6, StC 3 GOLF: StC 151, N-SA 156 VBASE: StC 8, TES 0 Atkinson '15 to Roanoke VTEN: StC 9, TES 0 Partee '15 to Haverford Berry '15 to DePauw VBASE: StC 2, WFS 1 VLAX: April 13 &amp; 15 Recap VBASE: StC 5, FUMA 1 2015 Outdoor Track Team 2015 Golf Team Tyson '15 to Virignia Roberson '15 to Richmond VLAX: StC 20, DF 7 JVLAX: StC 12, Freeman 6 Swanson qualifies for Olympic Trials Sam Partee, 3/31 VBASE: StC 16, Collegiate 1 2015 Tennis Intro 2015 Baseball Team 2015 Lacrosse Team Lacrosse Recap VTEN: StC 7, Collegiate 2 VBB: Cape Henry 75, StC 61 VBB to State Semis D.T. Badley '17, State Champ Carrington Lanier '15, State Champ Joey Prata '17, State Champ VBB: StC 53, WFS 30 VBB 6-Game Win Streak VBB: StC 60, BCP 59 4x400 - St. Chris Invite Futsal Highlights - 1/29 Wrestling: Va Duals Highlights VBB: STAB 80, StC 67 Swimming: Trey Berry Interview VBB Recap, 1/17 VBB: #8 StC 65, NA 47 VBB Recap VBB: Henrico Tournament VBB: #6 StC 55, Collegiate 36 Swimming Intro Squash Intro Rohan Dhar '16 Interview Wrestling Intro Futsal Intro VBB: 2014 Rebel Champs VBB: StC 99, Steward 69 Bedell '15 signs with Furman 2014 State Soccer Champions! Reinhart &amp; Trunick State Champs Intro VFB: BCP 34, StC 15 VSOC: State Tourney Update VFB: StC 17, Collegiate 6 Jack Workman '16, all-Prep Prep League Meet Joey Cuevas '16, all-Prep Spirit Week Pep Rally 2014! BIKE: Edward Anderson '17 VSOC: StC 2, Woodberry 0 VSOC: StC 1, Collegiate 0 VFB: StC 31, TES 17 VSOC: StC 2, Covenant 0 VFB: StC 17, PVI 0 VSOC: NA 2, StC 1 JVSOC: StC 10, FUMA 0 (J. Franko '18) Bulldog FB 20, CHMS 0 (M. Gnapp '15) StC Pregame Show, 10/3/14 VFB: FUMA 48, StC 38 VSOC: StC 3, TES 0 (Wood's 300th win) StC Pregame Show, 9/26/14 VFB: BCP 23, StC 17 JVFB: StC 40, Cadets 8 VFB: StC 44, Norfolk 0 XC: Joey Cuevas, Sept. 17 JVFB: Norfolk (by M. Gnapp '15) VSOC: BSC &amp; Collegiate Highlights VFB: O'Connell 27, StC 10 2014 WFS Invitational VSOC: StC 4, Walsingham 0 VFB: StC 38, SS/SA 14 2014 Football Intro William Boyd '15 Postgame VSOC: StC 3, Paul VI 2 (John Szymendera '16 &amp; Teddy Claiborne '15) 2014 Sailing Team 2014 Cross Country Intro 2014 Soccer Intro William Hardy '06 in San Antonio Spurs parade 2014 Athletic Banquet Slideshow 2014 Athletic Banquet Video - Blanton II VLAX: SS/SA 10, StC 8 Hayes to Sewanee Carter to R-MC Hingst to Richmond Essex to Georgia VLAX: StC 8, Collegiate 5 VLAX: Game-Winning Goal VLAX: StC 9, EHS 8 (OT) Farley, Williams, Wallace Interview Peete &amp; Romig All-Prep Golf: Prep League Tennis: StC 5, CHC 2 VLAX: StC 11, WFS 6 VBASE: TES 3, StC 2 VLAX: StC 17, NA 10 Wallace '15 to Cornell VLAX: StC 24, Benedictine 0 VBASE: StC 10, FUMA 0 2014 Tennis Intro Lindisfarne visits StC Golf: StC 152, Norfolk 156 Lax: StC 18, N-SA 0 2014 Golf Intro Tennis: Potomac 6, StC 3 2014 Baseball Intro 2014 Lacrosse Intro Taylor '15 to Michigan VBB: SS/SA 70, StC 53 VBB: TES 66, StC 61 VBB: StC 66, WFS 43 William Kelly, 2014 State Champ Joey Prata, 2014 State Champ Carrington Lanier, 2014 State Champ Tyler Anthony, 2014 State Champ VBB: StC 57, Collegiate 40 VBB: StC 57, FUMA 47 VBB on 4-game streak Adams to High Point Moffatt to VMI Three commit to H-SC VBB: StC 83, CCS 70 VBB: Weekend Recap, 2/1/14 Fiorelli to Navy VBB: TES 60, StC 55 VBB: STAB 59, StC 54 Squash: WFS 7, StC 2 VBB: StC 80, FUMA 47 VBB: Recap, 1/11/14 VBB: CCS 65, StC 61 2013-14 Squash Intro VBB: #9 TES 64, StC 55 VBB: StC 64, #8 Matoaca 55 VBB: TDIT Weekend Recap VBB: 1-1 Road Trip 2013 Basketball Intro 2013 Wrestling Intro 2013 Futsal Intro VBB: Rebel Invite Champs VBB: StC 58, Albemarle 46 Widhelm to Furman VSOC: Ireton 4, StC 3 (PKs) Pep Rally 2013 JVFB: StC 20, WFS 19 Dunlevy to VMI VSOC: StC 4, Collegiate 0 VFB: StC 34, EHS 30 JVFB: StC 13, EHS 0 VSOC: StC 5, Benedictine 1 VFB: StC 34, Paul VI 18 VSOC: NA 3, StC 1 Chance meeting hits home JVFB: StC 21, FUMA 7 VSOC Update, 10/8/13 JVFB Gray: StC 14, Collegiate 6 VFB: StC 42, FUMA 14 Ganon HIngst, 10/4/13 Anthony Robles Visits StC VSOC: StC 1, TES 0 VFB: Benedictine 14, StC 10 VSOC: StC 2, CCS 0 JVFB: StC 42, Cadets 0 VSOC: Menno Classic Champs VFB: StC 36, Norfolk Academy 0 JVFB: StC 33, Norfolk Academy 6 VFB: O'Connell 33, StC 20 JVFB: StC 35, O'Connell 26 VFB: StC 27, SSSA 0 JVFB: StC 21, SSSA 0 2013 Football Intro 2013 Soccer Team VFB: StC 35, TES 0 Fockler '14 to H-SC 2013 XC Intro 2013 Sailing Intro AD John Gordon We're Ready for 2013-14 2013 Athletic Banquet - Blanton 2013 Athletic Banquet Slideshow State Title Coverage LCA Interviews VBASE: StC 3, LCA 1 VBase: StC 8, FUMA 4 Setliff and Partee Golf: WFS 147, StC 158 VLAX: StC 11, Collegiate 10 VBase: StC 5, L.C. Bird 1 Robert Murphy Ben Foley VLAX: StC 8, Covenant 6 O'Ferrall to West Point Hollerith to W&amp;L VBase: StC 5, Cadets 1 Coll. 145, StC 165 Swim Duo to Mary Washington VBase: StC 10, STAB 0 VLAX: CCS 15, STC 13 STC 9, STAB 0 Bruner to CNU VLAX: STC 11, HRA 9 Sumpter to Dickinson VBase: STC 3, GCA 2 Peter Ferramosca 2013 Lacrosse Intro 2013 Tennis Intro 2013 Golf Intro 2013 Baseball Intro VLAX: STC 15, TES 5 VBB Playoffs JV Undefeated VBB: STC 62, Collegiate 46 Ryan Nelligan, 2/16 Mitchell Phillips, 2/16 Prep League Track Tarkenton, Second in 100 Breast Fauls 100 Butterfly State Champ Dallas Tarkenton, 200 IM Henry Fauls, 100 Fly 4x200 Freestyle Relay Joey Prata, State Runner-Up State Champ William Kelly, 113 Robert Janis, Three-Time State Champ Marshall Hollerith, State Champ Tyler Anthony, State Champ Charles Moore Pin VBB: FUMA 60, STC 58 9thBB: P'Burg 63, StC 59 English Signs VBB: CCS 54, STC 51 Swimming Wins Prep League Alexander Petrie Breaks Ankles Game Tying Shot - 5th Grade League VBB: BCP 59, STC 49 Squash: STC 7, WFS 2 JVBB d. WFS Williams 1,000 Pts VBB: STC 69, WFS 47 Weekend Recap, 1/19/13 VBB: STC 72, FUMA 67 (OT) Bulldogs 48, Cougs 45 VBB: STC 68, Collegiate 42 VBB: STC 74, CCS 68 (OT) VBB: New Year Recap VBB: Christmas Recap VBB: StC 67, TJ 38 This Is Redman - "Winter Program" VBB: StC 69, NA 55 Indoor Track Intro VBB: StC 70, WF 54 VBB: TES 60, STC 53 Futsal Intro Swimming Intro Wrestling Intro Squash Intro Janis to Maryland 2012 Basketball Intro Excite Night, 2012 Williams to Drexel Excite Night Is Here! Colin Hodgson, Marathon Man Semis Hero Ben Vaeth VSOC: STC 2, SSSA 1 VSOC: STC 3, WFS 1 VFB: Cougars 27, STC 19 JVFB: STC 20, Collegiate 6 VSOC: STC 3, CCS 0 VFB: WFS 13, STC 6 VSOC: STC 2, WFS 1 Doug West, 10/26/12 JVFB: WFS 20, STC 18 VSOC: STC 1, Cougars 0 VSOC: STC 1, Steward 0 VFB: STC 41, EHS 8 VSOC: STC 2, CHC 1 JVFB: STC 33, EHS 6 VSOC: STC 3, Cadets 0 VFB: STC 44, PJPTG 3 JVFB: STC 22, PJPTG 18 JV Gray: STC 14, Cougars 8 VFB: FUMA 27, STC 14 JVFB: STC 42, FUMA 6 VSOC: STC 3, TES 1 VFB: BCP 35, STC 18 JVFB: Cadets 27, STC 18 VSOC: STC 3, BSC 0 VFB: STC 40, NA 14 JVFB: STC 32, NA 6 9-19 Meet VFB: STC 35, STAB 10 JVFB: STC 22, CCS 6 2012 Football Intro Will Abbott VFB: SSSA 14, STC 12 JVFB: STC 20, SSSA 0 2012 Soccer Intro VFB: STC 21, TES 6 English to UVA 2012 Athletic Banquet Slideshow 2012 Athletic Banquet Video State Meet Cameron Barlow SS/SA 12, StC 9 Base: Cadets 3, StC 2 Base: STC 13, Flint 6 TES 6, STC 3 BB: STC 7, Cougs 1 Adam Ball on U.S. Open Qualifying Harris Blair STC 9, FUMA 0 Stephen Lestyan's Chip Birdie STC 168, FUMA 195 StC 17, Cadets 4 Tennis Intros Sam Ball in Upper School Chapel BB: StC 8, STAB 1 Jansen Fraser Base: STC 4, TES 3 Gnapp &amp; Hall Tennis: STC 5, Cougs 4 Lax: SS/SA 9, STC 8 Coach Sarah Harper Golf Intros 2012 Lax Intro 2012 Baseball Intro Tennis: STC 5, MG 2 Lax: Hill 8, STC 4 Tony Szymendera Top 10 Plays, 11-12 O'Connell 61, STC 51 STC 81, FUMA 62 State Champ Quent Alcorn "One More" State Title State Champ Robert Janis State Champ William Kelly STC 60, Collegiate 42 Giles Thompson JVBB: STC 36, Collegiate 35 STC 77, FUMA 52 STC 65, STAB 51 Cottrell to Roanoke Farinholt to Denison Barlow to CNU STC 39, LCA 33 Gordon on LCA win STC 71, CCS 64 STC 55, Amelia Academy 44 St. Christopher's Invite, 2012 Marshall Ware TES 60, STC 50 WFS 69, STC 68 STC 66, PJP 54 STC 61, STAB 43 STC 53, FUMA 51 STAB 9, STC 0 STC 58, WFS 53 (OT) Futsal Intro Indoor Track Intro JVBB: STC 43, WF 30 Squash: WFS 9, STC 0 STC 58, Norfolk 56 STC 48, Collegiate 26 Met Challenge Baseball: Osgood to Sewanee TES 65, STC 59 Janis Hopewell Invite Champ StC 62, Norfolk 37 Hiter Harris Football: Top 10 Plays, 2011 StC Rebel Runner-Up Wrestling - "One More" Wrestling Team Intro StC 67, Varina 47 Basketball Intro LCA Highlights Golf: Ball to VCU Coach Michael Turner Hook &amp; Ladder Squad BI Game Winner STC 38, BI 34 Baseball: Reinhart to W&amp;M Baseball: Fraser to Richmond Centennial Athletic Slideshow Aoky Sarhan Andrew Gnapp Saints 17, Cougars 6 JV Saints 14, Collegiate 7 Introducing "The Red Men" FB: WFS 26, Saints 13 Soccer: STC 0, Coll. 0 Behind the Scenes: Henry White at Warrior 40 FB: Saints 13, EHS 12 FB: JV Saints 35, Episcopal 0 FB: Saints 24, PJPG 9 FB: JV Saints 34, PJPG 6 Soccer: STC 4, FUMA 2 J.T. 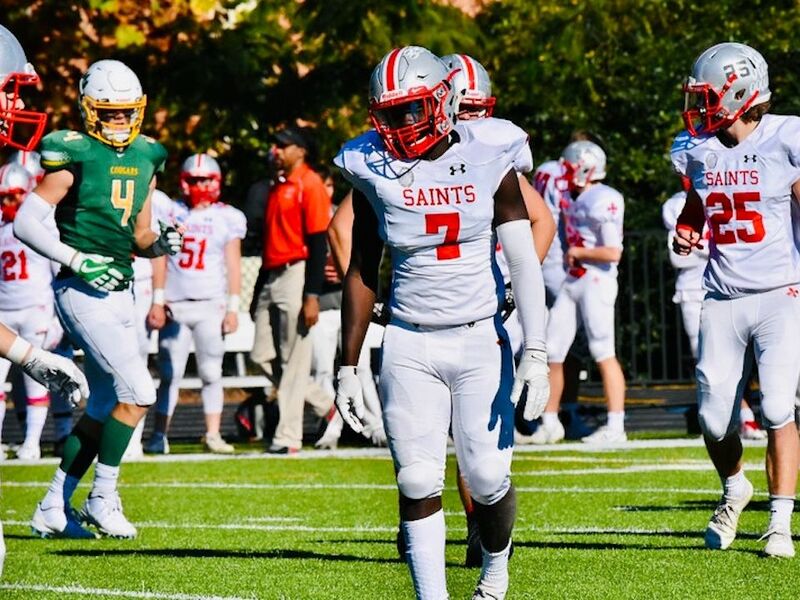 Beck on Blocked FG FB: STC 28, FUMA 27 JV FB: Saints 42, FUMA 26 Bulldog FB: Saints 30, Cougars 28 FB: Cadets 48, Saints 45 (4 OTs) FB: St. Chris 40, Norfolk Academy 0 FB: St. Chris 3, STAB 0 Baseball: Yorgen to ECU FB: St. Chris 34, SSSA 13 Soccer: EM 1, STC 0 XC: Whitlock &amp; Rowe Soccer Intros FB: StC 33, Trinity 0 FB Intros 2010-11 Athletics Highlights 2011 Athletic Banquet Slideshow Adam Ball Lax State Final: Episcopal 9, St. Chris 4 Paul VI 4, St. Chris 2 St. Chris 10, Collegiate 6 Prep League Meet StC 142, Coll. 160, STAB 168 St. Chris. 11, Woodberry 0 Collegiate 11, St. Chris 9 Lynde &amp; O'Connell Rob Vozenilek St. Chris 11, Middleburg 5 Christchurch 12, St. Christopher's 9 Woodberry 212, St. Chris 220 St. Chris 20, FUMA 9 Golf Intros, 2011 Bolling &amp; Taylor Tennis: Collegiate 7, St. Chris 2 Casey Fox on Winning Hit Tennis Intros, 2011 Richard Peyton Percy Andrews St. Chris 11, Bullis (Md.) 9 Coach John Burke Lacrosse Intros, 2011 Tony Szymendera Baseball Intros, 2011 Top 10 Plays, 2010-11 Miller 84, St. Chris 52 Quent Alcorn, State Champion Robert Janis, State Champion Trey Tarr, State Runner-Up David Wesley, State Champion John Gordon Woodberry 52, St. Chris 50 St. Chris 64, STAB 51 St. Chris 67, Collegiate 58 Christchurch 66, St. Chris 61 St. Chris 53, FUMA 51 Varsity hoops review Record-setting 4 x 800 Ben Constable, 1,000m (2nd) Aoky Sarhan, 4x4 &amp; 4x8 St. Christopher's Invite, 1/29/11 JV Saints 51, Woodberry 48 Woodberry 57, St. Chris 52 St. Chris 62, STAB 60 Jack English, 1st In-Game Dunk St. Chris 75, FUMA 66 St. Chris 53, Woodberry 52 St. Chris 50, Collegiate 44 Vance commits to Presbyterian Henrico Tournament Recap Season Wrap-Up Interviews Season Wrap-Up Interviews Jamie Ball, Season Wrap-Up St. Chris 52, LCA 46 St. Chris 74, N-SA 42 St. Christopher's Invitational Dec. 11th Meet St. Chris 41, Trinity Episcopal 37 St. Chris 54, Norfolk Academy 46 David Wesley, 12/6/10 Freeman 52, St. Chris 49 (OT) Benedictine 59, St. Chris 45 St. Chris 58, Godwin 50 Fall Strength &amp; Conditioning Atlee Scrimmage Highlights Basketball Excite Night 2010 Coach Hamill Jones, 11/19/10 Gene Bruner Interview Michael Turner Interview Celebration! Collegiate Game 2010! School Pep Rally 2010! Just Another Friday at St. Chris! Fall Sports Highlights!